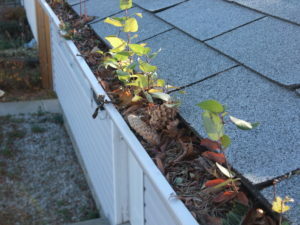 It’s a good idea to clean your gutters and downspouts at least once a year, ideally each spring and fall. Leaves, twigs, and shingle debris can block proper water flow to the point having a little waterfall directly off your roof. Allowing your eaves troughs to become clogged and dysfunctional can result in overflow during rainstorms, which will prevent water from being dispersed properly to the soil surrounding your home. As water accumulates, it will often pool where the foundation of your home meets the soil bed. This can cause serious problems for the foundation and structural integrity of your home. During the winter, water buildup can penetrate through your walls and roof and cause major issues like leaks and insulation problems. We service bungalows and low pitched two story homes. To avoid excessive damage on the gutter tracks we place the ladder at one point to get onto the roof and work from there. This way is faster, safer, and more thorough than working from standing on a ladder and needing to move around.